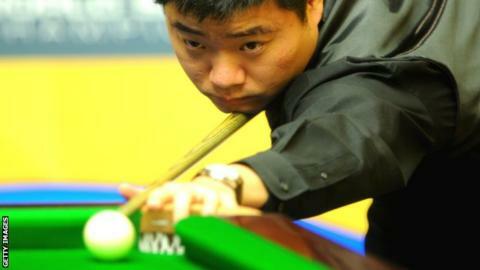 China's Ding Junhui won a record-equalling fifth ranking event of the season as he beat world number one Neil Robertson 10-5 to claim the China Open. The 27-year-old world number three is the first player since Stephen Hendry in 1990/91 to win five in one campaign. Ding made breaks of 87, 61, 119 and 59 in building a 6-1 advantage. Robertson won with the eighth frame with a 102, his first century of the week, but Ding added a 104 and sealed his 11th career title with a run of 66. That took him ahead of Jimmy White and into sixth place on his own on the all-time list, behind Hendry (36), Steve Davis (28), Ronnie O'Sullivan (26), John Higgins (25) and Mark Williams (18). Defending champion Robertson, hampered by a virus throughout the tournament, never recovered from a slow start, losing the first three frames with Ding taking the third on the final black. Robertson reduced the deficit to 3-1 but that was as narrow as the gap was to get in the remainder of the match. The Australian was able to record his 93rd century of the season, however, and has the opportunity to complete an historic century of centuries at the season-ending World Championship in Sheffield, which begin on 19 April. "I can't tell my feelings now about winning five ranking titles this season," Ding said. "With so many wins, my mindset is very different than before. "I'm getting more and more experienced, playing many finals, especially playing Ronnie O'Sullivan in Welsh Open final. [Which O'Sullivan sealed 9-3 with a 147 maximum] I think I learned a lot from that match. I hope there will be more finals to come."